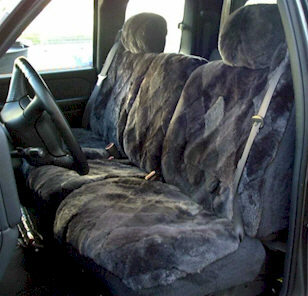 Manufactured using 1" thick Australian Merino uniform shaped sheepskin diamond pieces on the seating surface and seat back, integrating a matching stretch fleece acrylic material on sides and back of seat. If your seats have headrests, these will fit underneath them. Also, if your seats have the side impact airbags built into them or seatbelts integrated into the seats, just let us know and we'll make these to accommodate them. Just let us know under "Comments" as you go through the check-out process. Fully cloth lined. Click the "Add to Cart" button to enter Make, Model & Year of your vehicle.